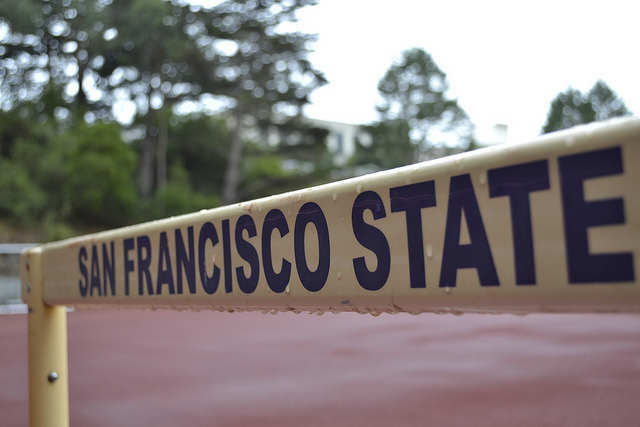 SF State experienced some much needed rain early Thursday morning for the first time in more than a month. Showers began to fall all over the Bay Area as a Pacific weather system moved across the northwestern part of the state, bringing unseasonably cool temperatures and light winds, according to the National Weather Service. The Cox Stadium is usually bustling with students exercising in the morning but the recent rainfall left the track and field deserted Thursday , Sept. 18. Annastashia Goolsby / Xpress. Beth Murphy, a political science major who commutes from Novato, said she welcomed the rain but didn’t do anything to prepare because she knew it wasn’t going to last. “We are in a serious drought right now, so anything we can get will help,” Murphy said. Other students on campus were glad to see the precipitation but remained skeptical of the impact it would have on drought conditions. The rain is definitely a relief from the summer heat, but it’s not going to last, said Arti Darke, a freshman in the anthropology department. Barbara Holzman, a professor in the geography and environment department who specializes in resource management, said she doesn’t expect the rain to have a huge impact on plants or water stores. She does believe the light rain will help alleviate some of the issues related to the drought, like the wildfires that are ravaging California. There are at least 10 fires blazing across the state as of Thursday, according to the Cal Fire website. The King and Boles fires surrounding Yosemite National Park prompted Gov. Jerry Brown to issue a state of emergency in two counties late Wednesday night. The Bay Area rain experienced this morning, however minor, lends some essential support to the thousands of firefighters working to contain the blazes. The National Weather Service reported nearly .60 inches of rainfall in the Santa Cruz mountains, the most precipitation in the area. According to the National Weather Service site, San Francisco doesn’t have to worry about rain carrying into the weekend. Forecasts from the NWS predict the moisture will taper off by Friday.